Description: Harmless. 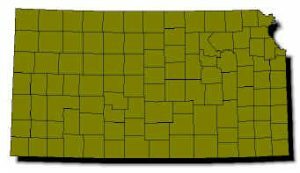 Largest snake in Kansas; keeled scales; pattern of 33–73 large brown or black blotches on brownish yellow body. Tail with alternating yellow and black bands. Belly yellowish with variable black mottling. Young same as adults. Habits: Lives in open grasslands as well as open woodland and woodland edge; common in cultivated fields where there is an abundance of rodents. Active from April to November; generally diurnal, basking in the sun or foraging for food, but becomes nocturnal during hot summer months. Number of eggs per clutch ranges from 3-22. Constrictor. 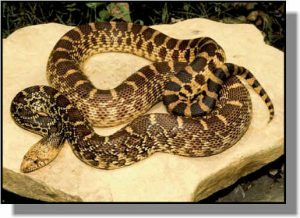 Most economically beneficial snake in Kansas, consuming large quantities of rodents and saving farmers from much grain loss; also eats pocket gophers, rabbits, ground squirrels, birds and bird eggs. Emits a loud “hiss” when disturbed or frightened.